Choosing a new or next faction is one thing, playing it is another, but the most interesting is where to start with color schemes and basing. Except for my Cryx, I tend to use custom bases, rather than flocking a normal base with sand or rocks. For the huge base format it depends on the model, my Hyperion and AFG are on a custom base, while both my Axioms and Kraken are on flocked bases. The site I use for my custom base purchases has always been: Model Display products UK. They have some really nice designs, and when ordering from Europe the UK is more beneficial compared to ordering from the US. Before I would spend time calculation which amount I needed for each base size, and I would order them all. While I find this manufacturer to pretty cheap I still wanted to see if I couldn’t make it cheaper for myself, as the amount of bases I have already used and will use in the future, do add up to a big number. I looked up information on casting bases, and after a few trial and error stages, I was able to cast some decent molds, and I’m currently casting bases at home. 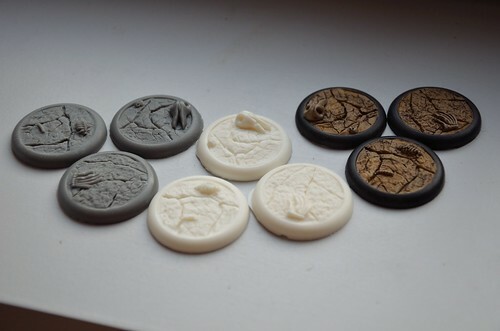 The picture below shows the original bases in gray, the copies in white, and some painted up copies to the right. The set I used is called: Cracked Earth and these bases are just wonderful. Having a cool set of bases and a nice color scheme for them is a good thing, but that still left me with the harder choice the color scheme for the models themselves. I started looking in the usual spot, the almighty Google. I was going to look at green, blue and orange for a main color, as I had seen some nice examples with those colors in the past. Purple was also a maybe. 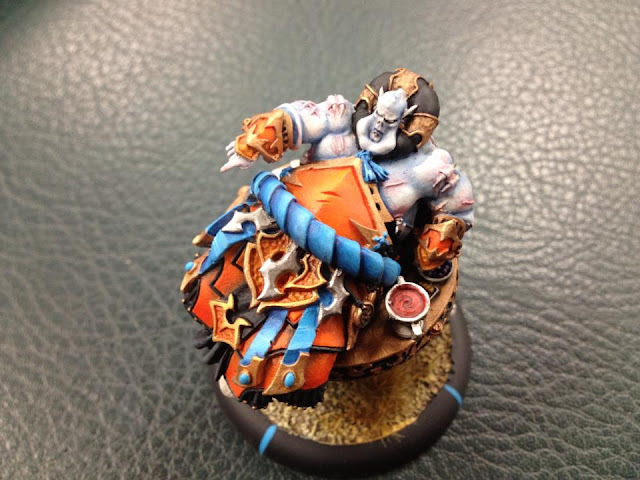 Then I came across pictures of the Skorne army painted up for Trevor from Chain attack. It uses a vibrant orange for the armor, a more red orange for the cloth and a nice blue for the ropes. 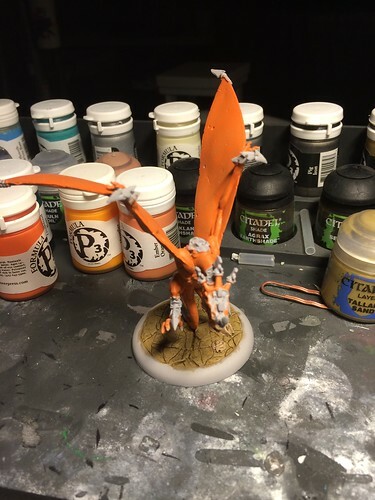 When you search for “orange skorne” in Google this is the first image that pops up, and this is the scheme I will attempt to reproduce. The painter has a facebook page here, his name is Ashton Holbrook. So far I’m testing out orange colors, and my first test with P3 Khador red highlight looks promising. It will need at least another layer (2 done already in the picture). I will add another layer tonight and then experiment with some washing for the darker areas. My goal is to get an end result that resembles the picture below as much as my skill allows. I can only hope my end result comes close to this one. At the very least this will be a good model to experiment on with the color variations I will need for the armor and cloth on the other models. I will continue painting / assembling / priming tonight, I’ll share some more progress shots soon.